Business psychologist Tony Crabbe outlines a unique three-step approach to combating one of the modern life's great problems: being too busy. Crabbe draws on entertaining psychological studies to show why we're getting it wrong at the moment and to develop a fresh new approach to taking back one's life from chaotic outside forces. How did they do it before? It’s a question many of us ask, as we stay glued to our laptops or our phone, always present, always working, always trying to be “productive” at all hours of the day. And yet, we can’t keep up. Which leads to that question: How did they (which, for those of us of a certain age, means “we”) do it before? 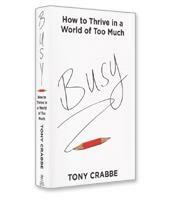 In his book Busy, business psychologist Tony Crabbe offers a succinct answer: because we are trying to resolve information-age problems with industrial-age solutions. We try to be more productive, we try to “manage time” — when the problem, according to Crabbe, is not that we have too little time to do what we have to do. The problem of the information age is that we give ourselves too much to do. The first face sees “busy as an experience.” This is the busyness, he writes, that keeps us harried and overwhelmed, the busyness that makes us feel that we don’t know how to manage our time. The second face of busy is, according to Crabbe, “busy as a success strategy.” In this case, we believe that success comes by busy more productively, by always striving to do more and more. Unfortunately, this type of busyness leaves us little time to do the “big stuff,” such as taking the time to think creatively. Finally, the third face of busyness is “busy as an approach to happiness.” This busyness face, writes Crabbe, refers to the goal of having more and more — more stuff, more popularity, more status. 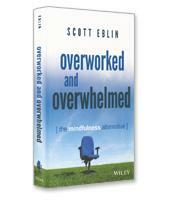 Values, relationships and our health are put on hold during a relentless acquisition frenzy. Crabbe’s third strategy, engagement, is designed to overcome busyness as an approach to happiness (the “having more makes me happy!” attitude). The three steps in this strategy are let your values define your meaning of success; develop deeper relationships with fewer people instead of piling up the number of connections; and replace the addiction to shallow buzz (“I’m flying from meeting to meeting.” “I’ve taken up this new hobby.” “I’m a player!”) with the joy of flow — Mihaly Csikszentmihaltyi’s famous term for losing oneself in a task and not realizing the time flying by. Busy is very clearly organized into the three sections focused on the three strategies. Each of the chapters in each section ends with a summary of the “big messages” of the chapter as well as one- to three-paragraph “go-do” and “experiment” sections. Perhaps some readers addicted to buzz and productivity might be tempted to focus on these end-of-chapter summaries. If so, they will have missed the point of this innovative and important book.